Nvidia is offering two of this year’s most anticipated games for free, when you buy its new GPUs. 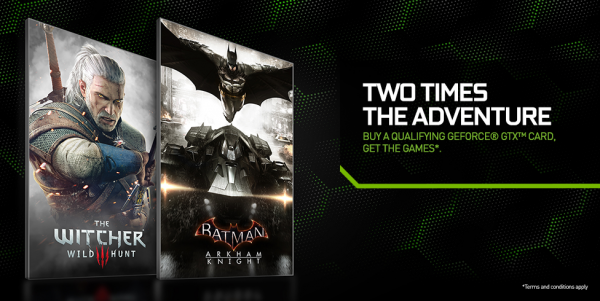 Those thinking about getting a GTX 980, or its more affordable brother the GTX 970, will be very happy to know that Nvidia will throw in free copies of both The Witcher 3 and Batman: Arkham Knight when you buy either of the cards. The GPU manufacturer revealed the promotion recently. You will receive a copy of The Witcher 3: Wild Hunt with purchase of all 900 series cards. Purchase of the higher-end cards (GTX 980 or GTX 970) gets you both The Witcher 3 and Arkham Knight. The offer is valid through June 1 at participating retailers around the world.